The 2019 Draft Lottery is in the books and the New Jersey Devils are now looking forward to picking a generational talent in either Jack Hughes or Kaapo Kakko in June. Hopes are high for these two teenagers, as they have the potential to change their new franchises for the better. In 1993, the Ottawa Senators were accused of tanking in order to draft “the Next Gretzky”, but Alexandre Daigle failed to score over 51 points in his ten-year career. When the New York Islanders picked Rick DiPietro first in 2000, the first goalie to ever go first in the modern era, it looked like they would be getting their starting goalie for the next decade. Instead, the Islanders got himuntil 2029, even though DiPietro hasn’t played since 2013. So you really can never tell how a pick will turn out. But, then again, sometimes you can. Sometimes, the writing on the wall is so obvious, it seems uncanny that anyone could have missed it. And yet, back in 1974, the Washington Capitals missed every warning sign: a paranoid league, an expansion franchise, a team who reached on a pick, intense pressure, and a slough of injuries. Sure, not everything was his fault, but because of this perfect storm of ineptitude, Greg Joly is the worst first-overall selection in NHL history. In 1974, the NHL decided to create two new expansion franchises in Washington and Kansas City. It was the league’s third expansion duo in four years, and part of the reason the NHL aggressively sought out new markets in the 1970s was the emergence of the World Hockey Association. The WHA had always been viewed as some sort of rebel league, and thus never taken very seriously. That is, not until the league began to offer lucrative contracts to teenage hockey players. The NHL had raised their draft limit in 1967 to 20 years after a lawsuit from a former player that cited labour laws. However, the WHA had no such history with legal issues, and sneaked away such underage stars as Mark and Marty Howe, Wayne Dillon and Tom Edur. This was unacceptable to the NHL, and they petitioned the Canadian Major Junior Hockey League (later the CHL) to allow their teams to draft underage players. They won, allowing the league to draft 19-year-old players for the first time in 1974. This was perfect for the NHL, as there were a few junior stars that would look very good on their two new expansion teams. When the Washington Capitals and Kansas City Scouts got together to run a practice draft, the Capitals selected the big Saskatoon defenseman Pat Price, while the Scouts opted for St. Catherine’s sniper Wilf Paiement. Both players were under the age of 20 and hotly pursued by many teams eager to add the young talents to their teams. However, that also meant that the WHA was sniffing around, and before the NHL could hold their real draft, Price had been signed by the Vancouver Blazers of the WHA and no longer interested in playing for an expansion franchise. The NHL was furious. They had wanted Price to help the Capitals get on their feet, and now he would be playing for the rival league. They scrambled to find an adequate replacement, and landed on Joly, another defenseman playing in Saskatchewan for Regina. The two players had similar, offensive-minded styles, but Joly was slimmer and had much less of an edge to his game. For the NHL, this was an adequate replacement. For scouts and journalists, this was an obvious reach. The Hockey News had published a list of their top prospects earlier and placed Joly seventh overall. The magazine’s top pick, Rick Chipperfield, had also opted for the WHA’s Blazers. More interestingly, the magazine placed one of Joly’s teammates as their fourth best prospect. 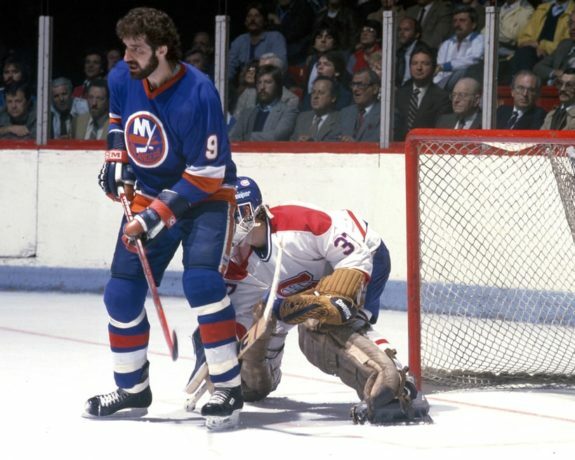 Sure, he wasn’t a defenseman, but Clark Gillies would go on to win four Stanley Cups with the Islanders dynasty, be named an All-Star twice in his career, and be inducted into the Hall of Fame in 2002. How he wasn’t everyone’s first selection is a mystery, but I’m sure the Islanders are thankful he fell to fourth. When the NHL expanded to 31 teams, they made sure that their new franchise in Las Vegas would be able to ice a competitive team right from day one. The expansion draft forced established NHL teams to fork over talented players to ensure the Vegas Golden Knights would have talent, and it worked – the Golden Knights made it all the way to the Stanley Cup Final that season against the Capitals. However, in 1974, the NHL did not have much experience to draw from. Other NHL GMs weren’t exactly thrilled to give up their core to some inexperienced team, so they didn’t. The expansion draft was little more than old teams unloading their dead weight, leaving the Capitals and Scouts with very little to work with. So, seemingly in an attempt to fill their roster will at least some talent, the Capitals took to the entry draft. After selecting Joly first, they made 24 more picks over three days in the longest draft in NHL history. Prior to the 1980’s, the draft could last as long as teams wanted to draft, ending once every team passed on selecting. Generally, these drafts lasted somewhere between 10-15 rounds; long compared to modern drafts, but manageable. Capitals’ general manager Milt Schmidt took advantage of this, though, and went 25 rounds – two longer than the next team. It was an act in futility, however; the 1974 Draft was low on top talent, and out of all those picks, only six would go on to play in the NHL, and none past the tenth round. It was an act of desperation from a franchise that knew they were going to struggle. Making it more difficult was the fact the the NHL had decided to hold their draft in secret in order to prevent the WHA from stealing any more of their prized prospects. The draft was thus held over conference call rather than in the Queen Elizabeth Hotel in Montreal. This did not sit well with many general managers, and the Buffalo Sabres’ GM, Punch Imlach, was so disgusted, he created a fictional Japanese player, just to stick it to the NHL. 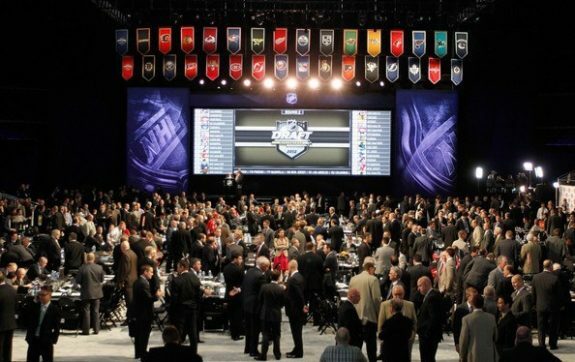 The NHL got the message the following year, opting to never have the draft via phone call again, and also helped found the Central Scouting Bureau. Doesn’t he look happy to be a Capital? With the draft finally over, the Capitals could finally get to playing hockey and see how their brand-new prospect would fare in the NHL. Hopes were sky-high for the teenager, with GM Schmidt going so far to call him the next Bobby Orr. Suddenly, Joly was the face of the new franchise and thrown head first against the NHL’s top competition. For a Bobby-Orr-type player, this shouldn’t have been a problem. But Joly was no Orr, just a farm kid from Alberta, and the pressure began to break him. He was going to be the messiah. And he was a hell of a hockey player. There was just way too much pressure on him. In their first season, the Capitals won eight games. Eight. That’s it. And only one of those wins came on the road. Their goal differential was minus-265, and they gave up 446 goals in the 80-game season. After their only road win of that season, against another perennial loser in the California Golden Seals, the team paraded out an old garbage can like the Stanley Cup. Veteran Ace Bailey got them all to sign it afterwards. They knew they were barely a team, but for a bunch of veterans and cast-offs, it was a memorable experience. 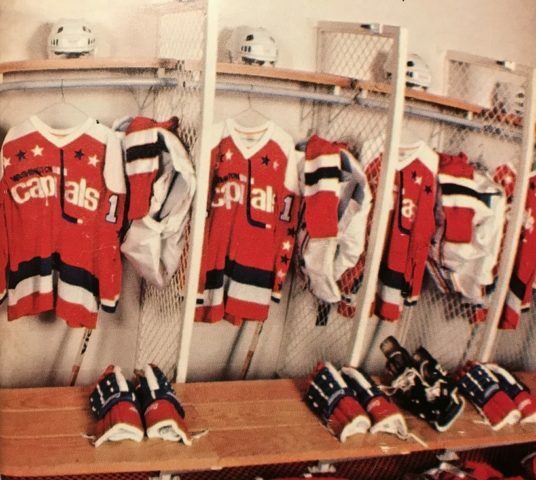 Washington Capitals 1974-75 jerseys (Photo Credit: 1974-75 Washington Capitals Media Guide). But for Joly, it was a debacle. After coming out of at Memorial Cup title and earning MVP honors, he had no way to deal with the tragedy that was the 1974-75 Capitals. The young defenseman only played 44 games that season due to injury, scoring a single goal and added seven assists to a team second-worst minus-68 plus/minus finish. He even scored on his own net, trying to corral the puck with his backhand, which teammates claimed was his best shot all season. It destroyed his confidence, and hopes of Joly becoming the next Orr quickly began to fly out the window. That first season for Joly was racked with leg injuries. In training camp, he injured his Achilles tendon, and then during the season, he injured his knee and had to undergo surgery to repair it. The following season, he managed to make some strides despite the team only winning three more games. He scored 25 points and increased his plus/minus to minus-46. But an ankle injury shortened his season to just 56 games. Schmidt’s comparison to Orr probably didn’t also include the career-ruining injuries, but that turned out to be the closest Joly would get to the famed defender. The Capitals’ first coach, Jim Anderson (who left partway through the first season with stomach ulcers), suggested that Joly play more a defensive game instead of carrying the puck, a huge shot to the confidence of the young defenseman. Their new coach, Tom McVie, tried to move Joly around as well, even putting him at center and left wing, but nothing helped. The fans had turned on Joly, who they saw as a massive disappointment. It was hardly Joly’s fault; the team had little chemistry at all. Still, the team needed a scapegoat, and McVie convinced management to trade their once-star prospect for some veteran leadership on defense. Ironically, that’s probably exactly what Joly needed. In 1976, the Capitals decided to give up on their first ever draft selection, sending him to the Detroit Red Wings for veteran leader Bryan Watson. With the Red Wings, Joly didn’t improve much, but he finally wasn’t the face of the franchise, and he could live in a little more obscurity. In 1978, his only season that wasn’t shortened by injury, he scored a career-high 27 points. Nothing reminiscent of a first-overall selection, but a respectable total. He also made his playoff debut that season, playing in five games but went pointless. He also broke his wrist in that series, which required an intense surgery, causing him to miss most of the following season. 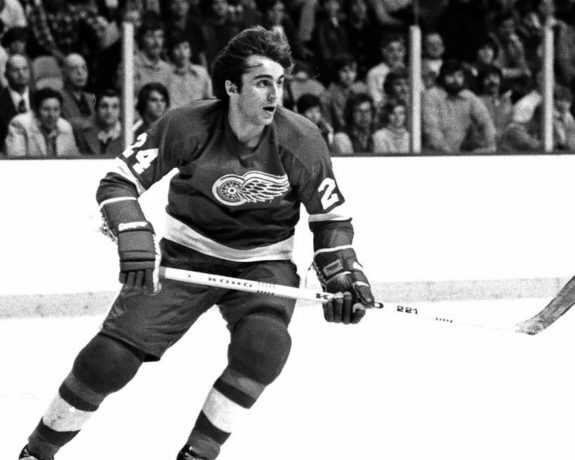 He remained with the Red Wings organization for another eight seasons, bouncing between the minors and the NHL, until he retired, broken and battered in 1986. Related: 1999: The Worst NHL Draft Class Ever? Despite the intense pressure, the lack of confidence from his team, and mismanagement of his abilities, Joly hardly ever complained. Even years later, he doesn’t regret much in his career. Most of what happened wasn’t his fault. And yet, the Capitals should have known better than to rush a teenage defenseman into the NHL and expect him to play like a proven veteran. When he didn’t they should have sent him to the minors to regain confidence, rather than change his position or tell him to change his game. It was a complete mess of a selection, which is why Joly is the worst first overall draft pick…ever.